Danger - cool watch approaching! 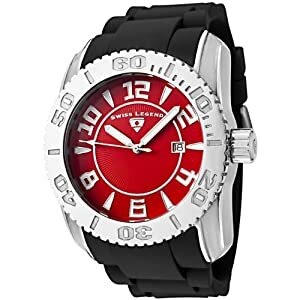 This watch screams for attention with its bright red face, stainless steel bezel, and silver-toned hands and hour markers. The black rubber strap completes the tough but stylish look. Like others in the Commander collection, it uses a Swiss quartz movement for reliable and accurate timekeeping. It is water resistant to 330 feet and safe for swimming, snorkeling and diving. The hands and hour markers are luminous for easy viewing in low light. What a cool watch!